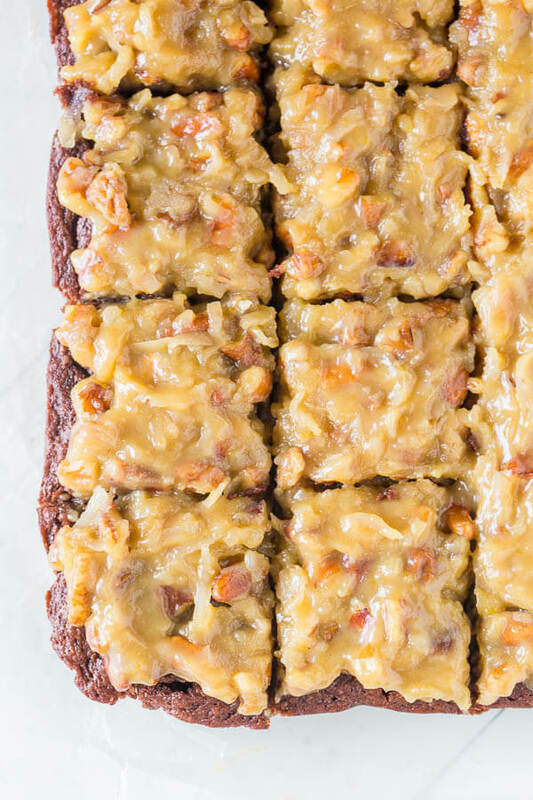 When you crave German chocolate cake, but don't have time to make one, this easy german chocolate brownies come to the rescue. You'll be devouring this fudgy goodness in less than an hour! Whenever I ask Garrat what kind of cake he'd like, whether it's his birthday, or any special occasion, german chocolate cake is always his first choice. He loves it so much. But I just never feel like making one. 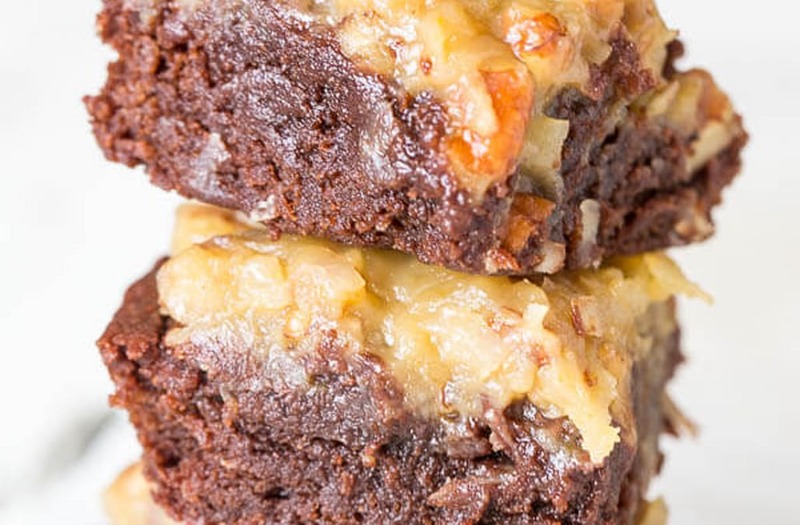 Full blown german chocolate cake (with the layers and all) isn't something you make on a whim. While I love decadent, labor-intensive recipes (hello, homemade croissants! ), layered german chocolate cake will happen only once in 5 years or so! And last year after we came back from Europe, I wanted to surprise Garrat with something special as a thank-you for a wonderful trip. I knew exactly what'll do the trick. Loaded with caramelized coconut-pecan filling, these rich and fudgy brownies are nothing short of real deal, but it takes less than an hour to make. Really, this recipe is quick and easy, there isn't much to point out. Just don't over-mix the brownie batter after adding the flour and be careful not to over-bake it. Two sins in brownie making affair. Why? Well, because over-mixing the batter will produce dry, dense brownies (yuck! ), and over-baking will also dry them out, exactly what we do NOT want. When in doubt, it's best to underbake them. Trust me. You see that fudgy goodness? 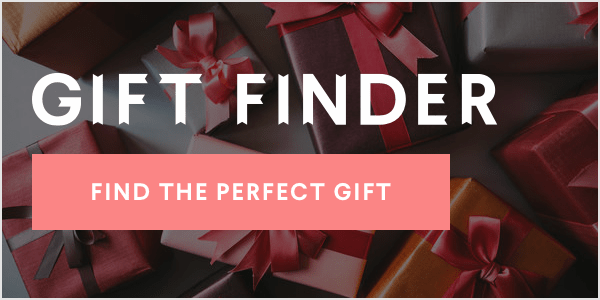 Oh my, it's simply the best! -To make the brownies, preheat the oven to 350°F (175°C). Line 8x8in (20x20cm) baking dish with parchment paper. -In a medium heatproof bowl, melt the chocolate and butter over simmering water until smooth. -Remove the melted chocolate from heat and stir in the sugar. Cool slightly. -Add the eggs and vanilla extract and mix until well combined. -Pour the batter into the prepared baking dish. -Bake for 20 minutes and check for doneness by inserting a toothpick in to the batter somewhere between the center and the edges of the brownies. If it comes out covered with batter, bake for another 2 minutes and check again. If the toothpick comes out slightly moist with a few crumbs, then it's ready. It should take no longer than 25 minutes. Cool completely on wire rack before removing from the pan. -While the brownies are baking, make the frosting. Place the pecans and coconut flakes in a medium bowl and set aside. -In a medium saucepan, whisk together egg yolk, brown sugar and salt until combined. -Then whisk in heavy cream and vanilla extract and cook over medium high heat for 5-7 minutes, whisking occasionally. The mixture will thicken, but it'll still be runny. -Pour it over the pecans and coconut flakes and mix until well combined. Cool to room temperature, then place it in a fridge to cool completely, until ready to use. At this point, the frosting will be thick and spreadable. -Once the brownies are cooled, spread the prepared frosting on top and cut into squares. -Refrigerate the frosted brownies, covered, for up to 3 days. *Instant espresso powder is not required, but it enhances the chocolate flavor without adding coffee flavor. 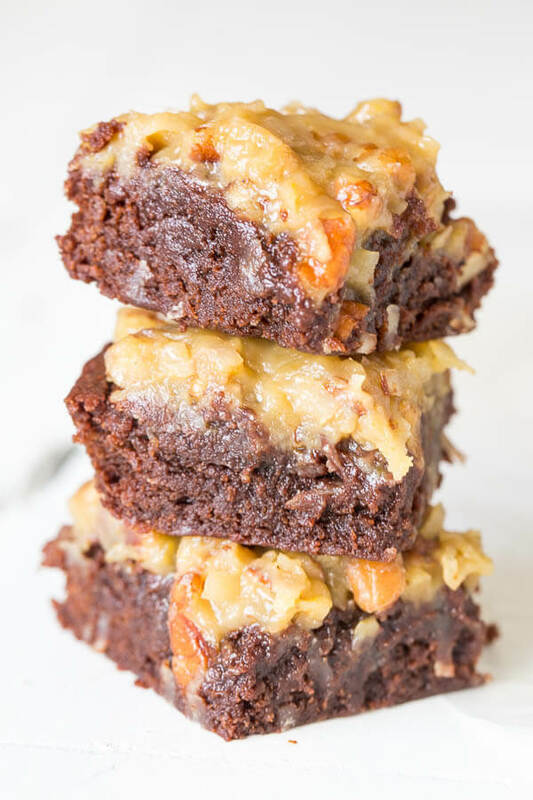 The post German Chocolate Brownies appeared first on Sweet & Savory by Shinee.